Winner of multiple awards at the Edinburgh Fringe Borders has come to London's Arcola Theatre for an extremely limited run. Tickets for Borders, winner of the Scotsman Fringe First Award, are now available for the Arcola Theatre transfer! Urgent, touching and sometimes wrenchingly funny, Borders uses two alternating monologues to comment on one of the greatest crises of our modern time. One voice is that of a lauded war photographer--a man whose pre-9/11 audience with Osama bin Laden has moulded his career. The other voice, that of a nameless young Syrian woman-- a woman 6 months pregnant, adrift in the Mediterranean on an ageing fishing boat which is swiftly sinking under the weight of the refugees it carries. 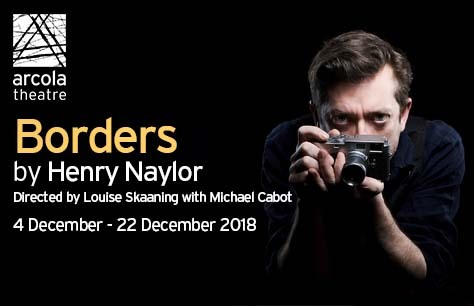 Henry Naylor’s incredible Borders made its debut at the Edinburgh Fringe where it won both a Best of Edinburgh Fringe Award and a Fringe First. The play has since had multi performances in North America before landing at London’s own Arcola Theatre for its extremely limited run. Borders is a show that cannot be missed. Book Borders tickets now to guarantee your seats. Both actors put in decent performances, but were let down by frankly poor writing. The narrative arc of the male photographer was unbelievable and crassly drawn, whilst continually making cheap and easy (and unearned) jokes at the expense of low culture. Female Syrian character had a more interesting arc but less engaging individual scenes, often cloying in their political overtones. Ultimately the play offered no substantive insight into its subject matter and instead leaned on safe and somewhat obvious political narratives. There was a good point to be made about the effect of the shifting economy (financial and attentional) which ended up buried under snarky digs at ‘low” culture and a sentimental and precious portrayal of Integrituois Artists. The staging neither added nor subtracted.